Our grandkids love their gadgets and spending time watching YouTube Kids or playing games. But they also enjoy spending lots of time outdoors. They seem to have a happy balance of both. 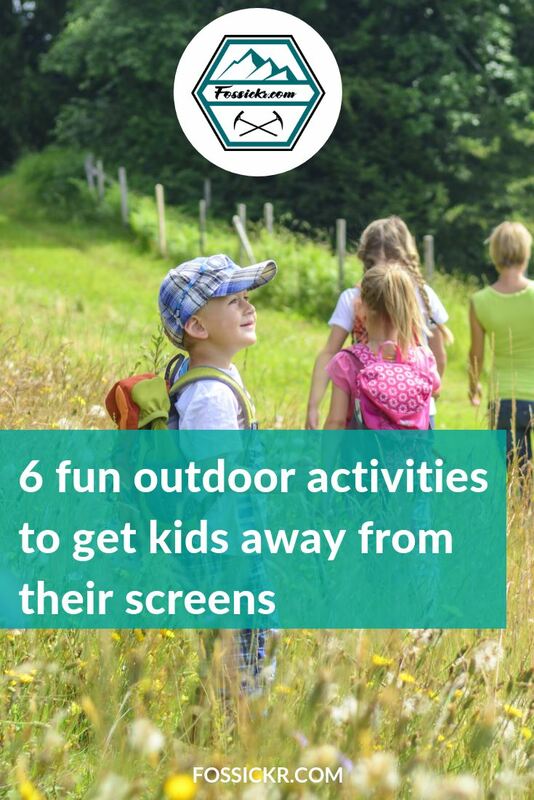 If your kids or grandkids have been spending too much time on their screens lately, here are some ideas to get them away from their screens and exploring the great outdoors, or perhaps even bringing their screens with them, but for a completely new purpose. Hiking in all seasons can be a joy (except perhaps when it’s wet, cold and muddy!). We often hiked with our kids and I’m so happy to see they are passing the love of outdoor activities onto the next generation. The kids might complain. They might complain about being too hot or too cold, their legs will get tired, but they will feel a great sense of accomplishment for doing a hike. Hiking can be a great boost to their self-esteem. Get them to track the hike using an app like Strava or Map My Hike. While we’re trying to get kids away from their screens, tracking their hike via an app and reviewing the data after the hike can help teach them about things like distance and pace and elevation. And at least they’re learning it outdoors while being active. Depending on where you live, hiking can be as low cost as grabbing a few snacks and a bit of gas for the car. If you live close to a large park or outdoor trails, very little prep work will be needed. If you live further away from somewhere to hike, then it could take a lot more planning to figure it out. Or you could consider going on an urban hike through your neighborhood, exploring a new area. Ask the kids to help you research where you’ll hike – they’ll feel more involved and more invested in the adventure if they feel like they have some control. You and the kids will need comfortable clothes to suit the season, walking shoes and a backpack for carrying a basic first-aid kit, lunch, snacks and drinks. And don’t forget that temperatures can change quickly in the mountains, so even if it’s warm when you set out, it might be freezing on top so it’s always best to pack a jacket. You don’t have to buy hiking gear and hiking boots to go for a hike. Make sure everyone enjoys hiking before investing in hiking gear. But there’s really no need, especially if you’re only going for a short hike. Don’t start out with grand plans for a 5-mile hike. Test a shorter 2 to 3 miles first. How far they can comfortably walk will depend on their age and level of fitness. 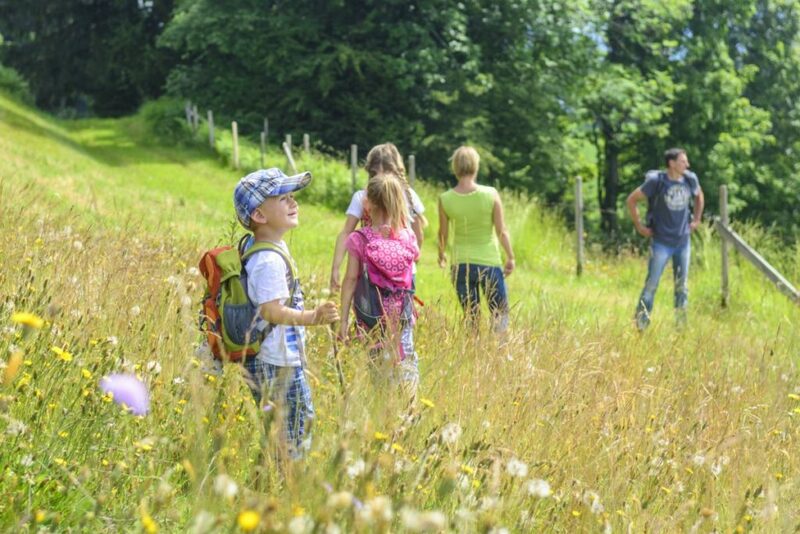 As well as tracking their adventure using a hiking app, you could make the hike competitive – not in a ‘who gets to the top first’ way, but create a scavenger hunt, a list of things for kids to find while out hiking. It could be anything from seeing a fallen tree to hearing a creek or finding a spider. Print the list out and give them a pencil to check each item off as they go. You could create different lists for each child to avoid the inevitable sense of competition. Pack a picnic lunch to enjoy and a special treat you usually reserved for special occasions. I bet the kids sleep early and sleep well after a day of hiking in nature. I’ll be honest here – geocaching wasn’t around during my days of hiking with my kids, so it’s something I don’t know much about, but my kids have taken their kids geocaching and they love it. They love telling me stories about their discoveries and they keep a passport for collecting stamps from different geocashes and they’ve hidden their own, as well. My grandkids explained that geocaching was “a bit like Pokemon hunting but for real things”. Geocaching is like a good old fashioned treasure hunt. You have to navigate to a set of GPS coordinates and hunt around for a container (the ‘geocache’). When you find the container, you sign the log book, take photos to prove you found it. There are different types of geocaches. Some offer a clue or piece of a larger puzzle, some have a stamp that you can use to stamp your own passport. Do some research online to find geocaches in your area. Download a Geocache App. to get the coordinates and then off you go! Prep work and costs are similar to hiking. You’ll need to work out which geocaches you’ll attempt to find. Pack a picnic lunch, snack and drinks and make sure everyone has comfortable clothing and footwear. 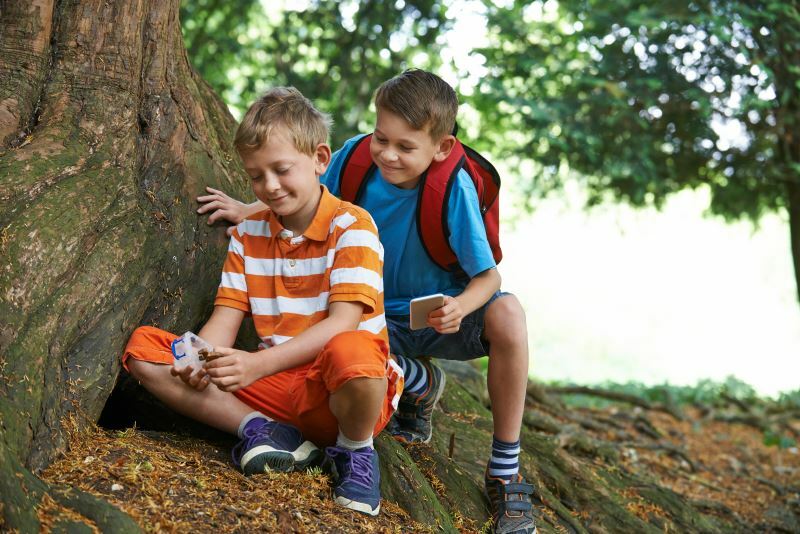 Geocaching is a fun activity to do with other families, too, so grab some of the kids’ friends and family and set off on a geocaching adventure. 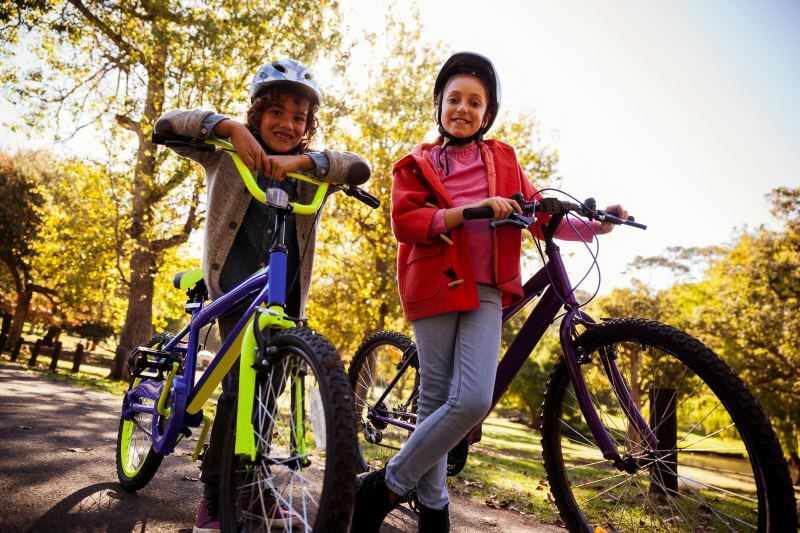 Bike riding is the most expensive option on this list if you and the kids don’t already have mountain bikes. But if you do, then like hiking, it’s one of the simplest, cheapest and most fun forms of outdoor fun. Like hiking, bike riding can be great for their self esteem and give them a sense of accomplishment. If you don’t have bikes already, then you’ll need to borrow or buy bikes. Decide whether an urban cycling or off-road mountain bike adventure suits your location and your kids’ ability. City councils or parks and recreation services in your area might have local cycling routes you can research to map out a route. I’ve never been a confident road rider, always preferring to stick to bike paths. Get the kids involved and ask them to help you map out the route. Download an app like Strava or Map My Ride to record the route and ride statistics. Like hiking, it’s an opportunity to teach them about distance, pace and elevation. Pack a picnic lunch and bring plenty of drinks. Water bottles in a wire water bottle holder are the most convenient. Metal detecting doesn’t have to be an expensive hobby. All you need is comfortable clothing, a metal detector, a trowel and something to store their finds in. You can buy metal detectors for less than $50. I guarantee your kids will love treasure hunting with it. It will keep them occupied for hours. 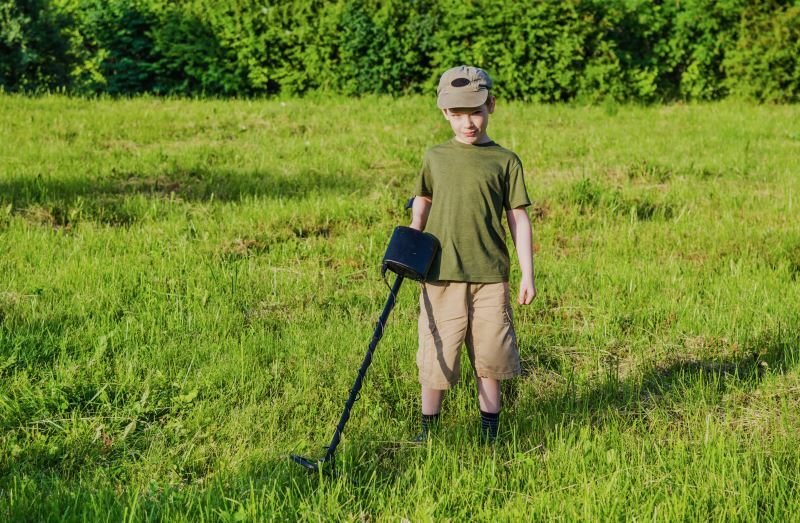 Metal detecting is a great way to get kids outdoors and away from their screens. 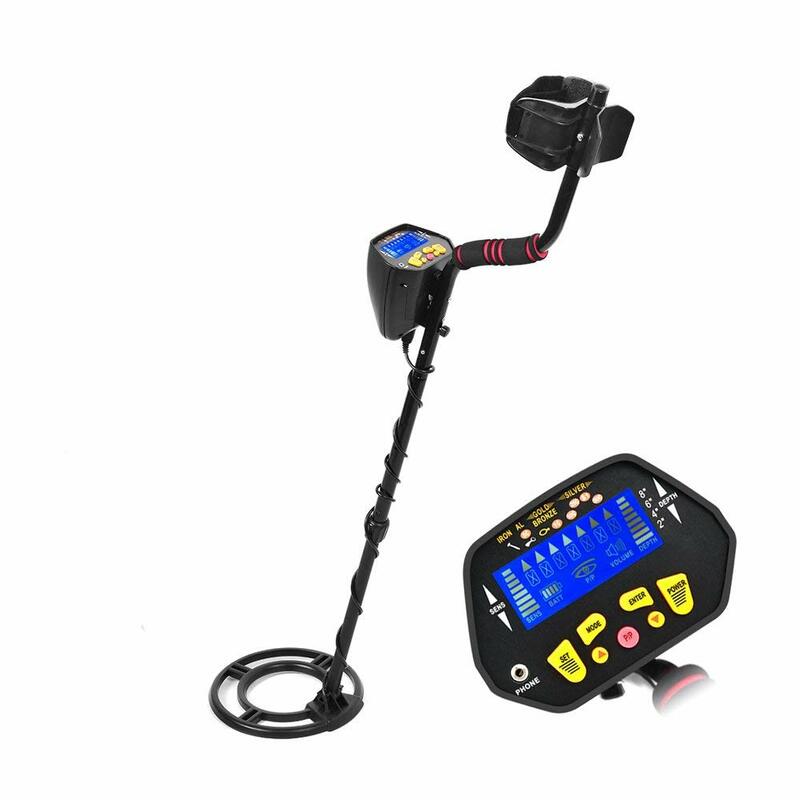 Buy a metal detector! Check out our review of the best metal detectors for kids to help you work out which metal detector is the best one for your family. If you decide to buy one unit, make sure it has an adjustable shaft so all kids can use it, regardless of their height. Buy one that’s lightweight so their arms don’t tire too soon. Get the kids started in your own backyard where they can practice listening for the audio tones that beep when it detects metal. Then find a local place where they can treasure hunt. Make sure it’s OK to hunt there. Always ask for permission if you want to hunt on private land. Your neighbours might be happy to let your kids detect in their yards. Read up on metal detecting etiquette to make sure you won’t annoy people. Research metal detecting forums to find places where they can metal detect in your area. Make a day trip out of it with a picnic lunch. Learning to fly a kite is a simple joy that every child should get to experience. Kids will be running and being active without even realising it. Buy a kite! There are some amazing kites for sale on Amazon for just $10 to $20. It’s a small investment in some big outdoor fun. You can buy all kinds of kites, from ones that look like traditional kites through to butterflies and dragons. You’ll find one that suits your child’s tastes and personality. 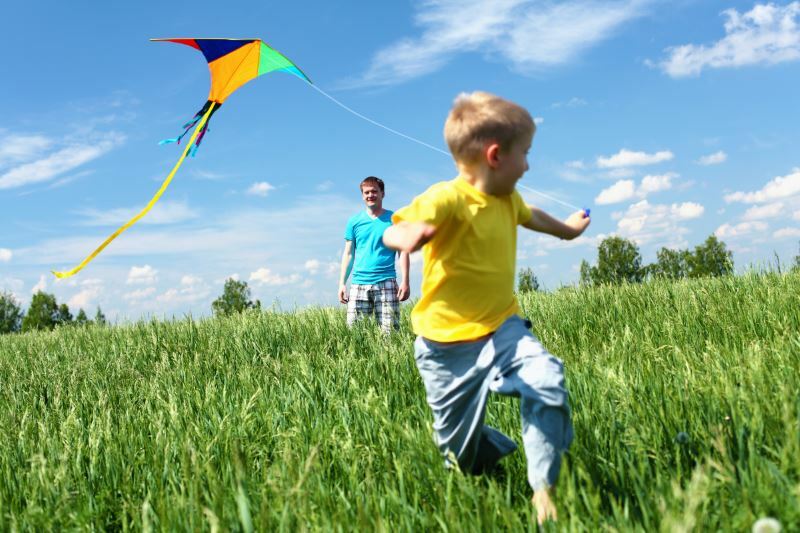 Find a local park with a big space where the kids can run around and fly their kites. 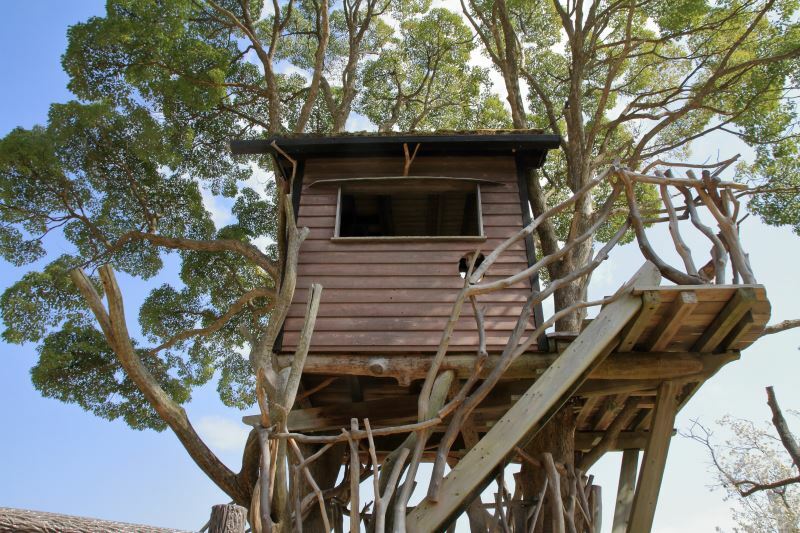 It doesn’t have to be as fancy as this tree house, but building a cubby house or fort in your backyard or in parklands nearby can be a fabulous and fun experience for kids. You don’t need a lot of prep work. After you’ve scouted for a suitable location, collect branches, old bed sheets, old blankets or plastic tarps and start building. The kids can do all kinds of activities once their cubby house or fort has been built. From having picnics to fighting trolls, they are only limited by their imagination. What’s your favourite outdoor activity for kids? Do you have a favourite outdoor activity you like to do with your kids or grandkids? Something that keeps them active and learning? Let me know in the comments below.